Squire’s Garden Centres have some stunning new plant varieties that have been bred and introduced to give your garden the wow factor this year. New varieties often mean plants of a higher quality, with more flowers, in more colours, and with better disease resistance. 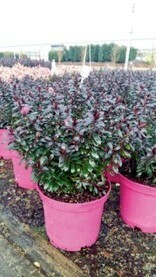 Hebe ‘Joan Mac’ – a shrub with glossy dark foliage and bright pink flowers. Raspberry ‘Little Red Princess’ – a compact thornless raspberry plant, perfect to grow in a pot. Hosta ‘Cathedral Windows’ – thrives in a pot and has large colourful leaves. Iberis ‘Snow Surfer’ – an evergreen plant with masses of small white flowers. Pieris ‘Polar Passion’ – an evergreen shrub with pink-red flowers. 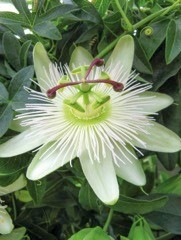 White Passion Flower ‘Snow Queen’ – a stunning climber with elegant white flowers. Polemonium ‘Kaleidescope’ – tall blue flowers to brighten up a shady corner.